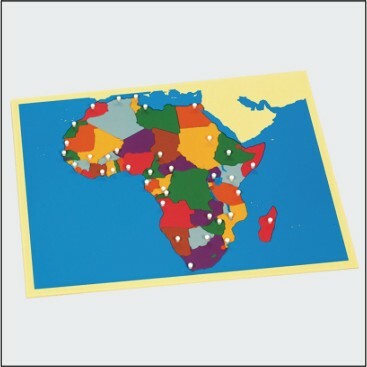 Working with puzzle maps of countries is a great way to start learning about geography. The best way to work with these maps is to have a control map with the names of the countries and capital cities of each country. Your child can look at the control map, work with the pieces of the map -- removing them, reassembling them on a mat out of the frame, and the putting them back into the frame. When your child is comfortable with the countries, introduce flags and then capitals. The control map can be a paper map that you have made yourself by tracing the pieces of the puzzle map. It can also be a regular map like the ones sold by National Geographic. Learn more about Montessori curriculum with our newsletters and teaching binders.